After Tucker and his brothers are born, they do everything together. The puppies eat, sleep, play, and watch T.V., but Tucker likes adventures. He especially loves the snow, and his ability to flip comes in handy when he goes for a ride on some children's sled. 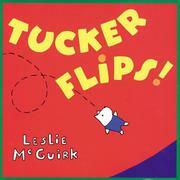 McGuirk, Leslie, “Tucker flips,” Children's Picture Book Database at Miami University, accessed April 21, 2019, https://dlp.lib.miamioh.edu/picturebook/items/show/7139.